The baby girl was caught on camera running and playing with a garden sprinkler - just like a child would - and could not stop coming back for more. At least that was the case for a baby moose who wandered onto the yard of Cory and Kristen Williams. 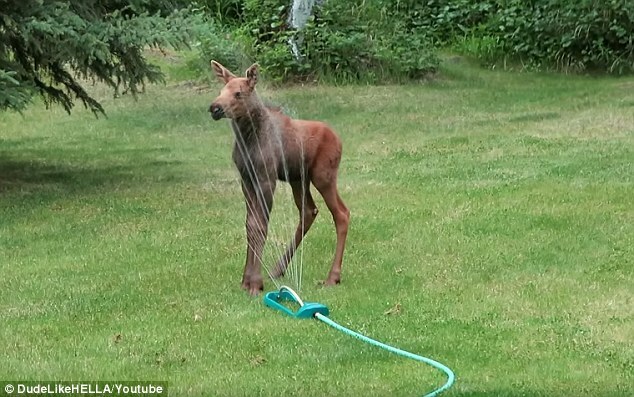 The couple decided to turn on the sprinkler for the moose to play with and after a few minutes the curious animal began slipping and sliding around the wet surface. Cory Williams says he 'couldn't help himself' but start filming when he saw a family of moose hanging out in his backyard in Eagle River, a community in Anchorage. The curious little moose appeared to test out the water by first having a little shower, AOL reported. However she soon returns, and does an adorable skid down the law to the sprinkler. The video shoes the moose coming back at least three other times, as her mom watches from close by. 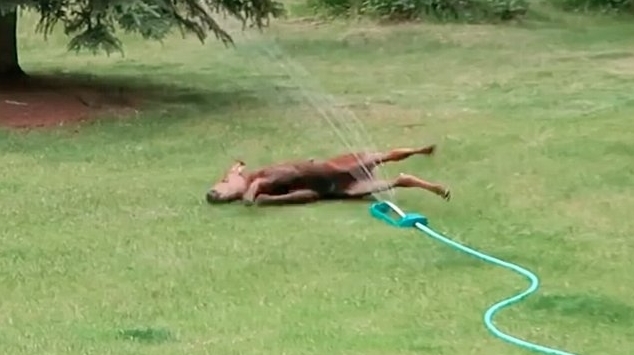 Responses to "Adorable baby moose plays in the sprinkler of a family's yard in Alaska"